I love love love love love love love love love love love love love love love love loved this series. Seriously, I'm talking pink puffy heart love. I hate Lord of the Rings type crap so I was totally skeptical. A world called Panem- fighting- war?!? That is so not my style. However, (did I mentioned that) I loved this series. 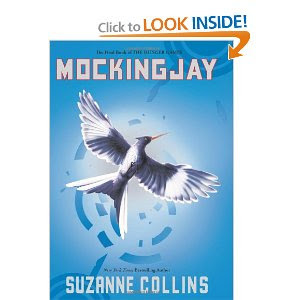 I preferred the first two books as a whole, but I really loved the ending of Mockingjay. This last book was a bit too gory for my taste and I wasn't as enthused by all the fighting and war, but the over all story just melted my heart. The worst part about falling in love with this series-- the fact that it's over. You are so right...I was sad to see it end! Oh girl I agree. I hate that it's over but I'm so looking forward to the movies! I'm anxious to see how the movies pan out. I loved the series too. I loved the first two, but found this one to be a bit disappointing. Oh man, these books were so damn good. I am so sad they are over. Le sigh. Flew through book 1... flew through book 2... stuck in book 3 and can't get motivated to finish.